After you tell your friends and family about your cancer diagnosis, information will start landing in your inbox at an alarming rate. “I read this article that said that you should try…” or “My friend Sharon had the same thing you did. Here’s what she did….” They all mean well, but what many do not realize is that a cancer diagnosis means something different for everyone. My breast cancer isn’t like your aunt’s breast cancer or that girl you went to college with that you found on social media; we’re all cancer snowflakes. Our treatments are different because our bodies are different and will all respond to cancer therapies differently. Before my diagnosis, I was one of those people who went to the gym, earphones in, magazine open, TV on. I was elliptical-ing to nowhere with constant stimulation around me. I needed the distractions so I would forget I was actually working out and my body was moving. I didn’t consider anything a workout unless it resulted in a pool of sweat. We live in a time when heart rates are supposed to be up and bodies should always be moving, whether it's on a reformer, a stationary bicycle or jumping up on boxes. But when you’re undergoing treatment for cancer, these options aren’t necessarily doing your body any favors. After my mastectomy, the elliptical was out of the question for quite some time, and eventually, the gym would become a danger zone for my body, compromised from the chemotherapy and the most susceptible to germs that I have ever been. That's when I decided to try yoga. 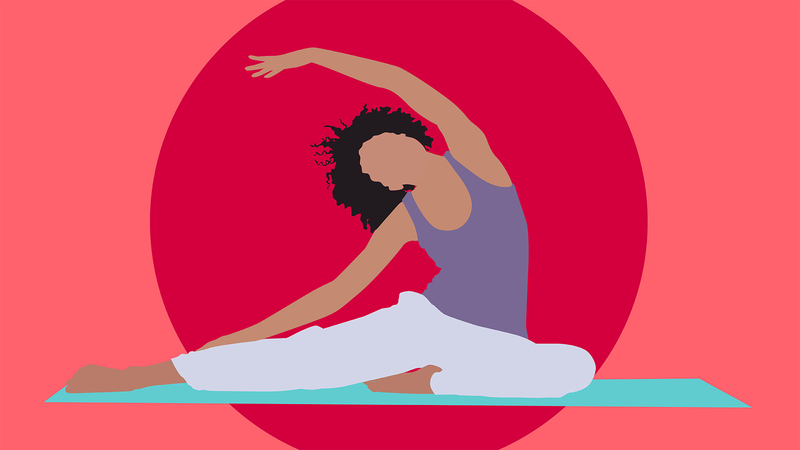 We all have different perceptions of practicing yoga, but for cancer patients, merging the mind and body into one form of exercise has proven to be beneficial in recovery. In addition to the ability to apply yoga breathing techniques during treatments, yoga is also known to lower stress and anxiety in the body. “Lowering stress levels is one of the great gifts that yoga brings people healing from cancer," Clampett says. "To be able to relax and even enjoy an activity with your body offsets the trauma and pain that can be associated with receiving a cancer diagnosis and going through treatment. We know from studies that practicing yoga oxygenates the blood stream, releases muscular tension and can even enhance immune function, which is extremely important when healing from cancer." In addition to the benefits yoga has on the bodies of those undergoing treatment for cancer, there is also an emotional component. Susan Wood, a registered yoga teacher, leads classes at the Pluta Integrative Oncology & Wellness and Breast Cancer Coalition of Rochester in New York and says that through practicing yoga, cancer patients can help manage fear and anxiety and can enhance body image and a sense of well-being. Finding an instructor or a center that is geared toward cancer patients has never been easier. Wood recommends the site Yoga 4 Cancer, which can connect patients to an instructor that teaches classes specifically geared toward yoga patients in their area. Another option is to ask your medical team if they have a studio or instructor they would recommend. If classes aren’t for you or you simply don’t have the energy to make it to a class, there are a number of videos or streaming services that are now available. Clampett offers an online series of therapeutic yoga videos designed for those who are undergoing treatment or healing. For those undergoing treatment that are used to a rigorous fitness schedule, the new normal of what your body can withstand will most definitely be an adjustment, but through a yoga practice, you might find it’s not just the body that is moving, but also the mind.